What’s all the buzz about Bobby and Jessica’s wedding? Very few weddings come and go where I can say EVERYONE laughed during the ceremony. Bobby and Jessica had a very memorable wedding at Paradise Cove in Orlando, Florida. Located just across the highway from the Walt Disney World Resort, Paradise Cove is nestled on the shore of pristine Lake Bryan. As guests were being seated, Bobby, the officiant, and both of his groomsmen boarded a ski boat for their grand entrance to the music of James Bond, played by Vinnie from Your Orlando DJ. Once on shore, their lined up and walked straight into the ceremony site, to thunderous applause from their guests. Jessica was kept tucked away in the Paradise Cove bridal cottage, but able to clearly see her knight in shinning armor standing in the front of the boat as it approached the ceremony site. Tara with Fat Catz Photography captured every moment. From the couple getting ready, the boat entrance, to the exit at the end of the evening. Atmosphere’s Floral and Decor decorated the tables with a beautiful nautical theme. The ceremony arch was also covered with vines, filled with sea shells, drift wood, and star fish. 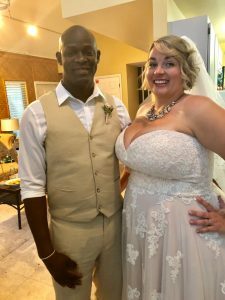 As the ceremony began, the bride and groom took their place in front of Rev.Glynn Ferguson from the Orlando Team of Sensational Ceremonies. The couple had chosen a beautiful civil ceremony with personalized vows, and a short reading at the end. Just as Rev.Glynn began to speak about love a wasp came flying in, buzzed around the couple, and came to rest on the inside cover of Rev.Glynn’s iPad cover. Without missing a beat, never loosing eye contact with the bride (who was terrified of the wasp) Rev.Glynn slammed shut the case and continued with the ceremony. After a few second, he turned to his right and realizing that the wasp had been killed, he flicked it into the bushes without any distraction to the couple or their guests. It was only after the ceremony, as family and guests were gathering to take pictures that the couple regaled those around them with the story of the wasp. Not one, had even been aware that it was going on.